Barbarians! Is there ever time when you look forward to barbarian encounters? Well, they’re at it again. They’ve wiped out your city and it’s time to find a new land to settle. Luckily for you, your chosen spot just so happens to have a large network of caverns below the surface. Nothing creepy about that. None whatsoever. Above and Below plays out over seven rounds with the winner being the player that manages to attain the most victory points by the end. Victory points can be earned in three primary ways: constructing buildings, the advancements track, and reputation. Of the three, the advancement track is the most interesting and is worth explaining. There are 8 different types of goods to be collected throughout the game and once collected, they can be committed to the advancement track. The track must be filled from left to right and each slot will accommodate one type of good. Once a good has been put in a specific slot, every subsequent good of that type must be put in the same slot. If you put mushrooms in the first slot, for example, all subsequent mushrooms must be put in that slot. You’ll be awarded victory points for every good that is in the advancement track at the end of the game. Every player begins the game with 3 identically abled villagers and will deploy them in order to achieve these goals. There are five actions that you can send your villagers off to do and on each turn you choose one of the actions to execute, after which they will be sent to the exhausted area on your player board to recuperate for next round. The round plays out until all players pass or are out of villagers to assign. The first action you can choose is Exploration which requires at least two villagers to accomplish. Simply choose the villagers that you want to explore the cavernous regions below your settlement and another player will read a scenario from the included encounter book. Each villager will roll a die to see how much they contribute to the exploration. Additionally, you can exert as many of your villagers as you want to increase their contribution by one, but putting the extra strain on their bodies means going to the injured area of your player board. If all of your dice rolling and exertion reach the target explore number you will be met with success which means not only gaining the rewards, but also claiming an underground cavern as a site for future underground buildings. Failure means no reward and no cavern. You can also choose to build from among the available buildings. You must assign a villager with a hammer symbol on them, indicating that they are a trained builder as well as paying the cost in coin as indicated on the building you choose to construct. There are two types of buildings, houses and outposts. Houses are built above ground and there are no limits to the the amount you can construct. Outposts are built below ground, but can only be built in empty caverns that you previously discovered through exploration. Buildings can provide goods, beds, reputation and much more. In order to gather the goods from your buildings requires taking the harvest action. You might find your initial group of villagers a bit lacking so, as another action, you can train new, more able villagers. A villager with a feather symbol is chosen as the teacher and a pupil is chosen from the available student supply. Learning is just as hard as teaching so both student and teacher are sent to the exhausted area to recharge. The final action available is manual labor. Simply select a number of villagers and they will each earn 1 coin for their troubles. If you are the first player in the round to commit to manual labor, you will be rewarded with a cask of cider in addition to your wages. The end of every round signals the time for rest. Every villager in the exhausted area will require a bed to sleep in and move them into the ready area to be available for next round. If you are short on beds, a villager can forgo sleep and instead recharge their strength with copious cider consumption, if you have it. Villagers in the injured area will require two days rest or health potions to aid in their recovery. After resting, players gain income according to their progress on the advancement track. And play continues. Above and Below, more than anything, seeks to evoke a sense of wonder and ambiance. It lures you in with its serenely painted landscapes and inviting domiciles. it’s obvious that a lot of care and attention when into every brush stroke. There’s a coherence and cohesiveness to the art that ties everything together that likely stems from the fact that the art and design comes from the same mind. Best of all, there’s a sense of mystery and the author trusts the audience enough to show hints of a larger world rather than try to explain every little detail. Why are there lizardmen mixed in amongst humans? What are crystals used for? And whether you’re looking at the over 30 uniquely illustrated villagers or the intricately painted resources, Above and Below never disappoints visually. And while its looks nearly justify the cost on their own, a game needs to have some substance in order to make a mark. As the overall quality of games has risen, being a good games isn’t good enough anymore. In order to be noticed a game needs something special, something to set it apart. And to that end, Above and Below injects a bit of storytelling into what would otherwise be a fairly standard game. Whether or not you enjoy Above and Below hinges almost exclusively on your enjoyment of the exploration system. Every exploration is accompanied by a reading from the encounter book which will lead to a decision that needs to be made. You might run across a traveling salesman, for example, and your options may be to steal from him or to barter with him. Very often, one choice is much more difficult to achieve than the other and you realize that it’s actually impossible for you to even achieve the more difficult choice with your current explorers so your only real option is to attempt the easier one. It’s a bit of a letdown to have your choices made for you, but it can be overcome with preparation. Training hearty explorers and assembling large excavation parties will more often than not lead to large rewards and riches. Which brings me to perhaps my biggest disappointment with Above and Below. A lot of effort is made to build out the world of Above and Below. From its evocative art to its individual villager portraits, the game does a great job of pulling you into this strange world. The encounters are well written, but they are purely setup. After you successfully fight off a group of glogos the encounter book simply states the rewards you receive. No resolution. It would be as if every novel ended with, “and they lived happily ever after.” Sure, you can infer what happened based on the rewards and if there are players adept in impromptu storytelling they can add some embellishment to the encounter, but that requires more of the players’ creativity than anything else in the game would lead you to believe. Despite this shortcoming, going on adventures is just fun. And your enjoyment of the game relies on your ability to buy into the experience that Above and Below is selling. Exploration is Above and Below’s calling card, but there is a larger game at hand that supports it. Most of it is very standard fare, but the economy adds an interesting wrinkle into the mix. As you add goods into onto the advancement track, your income every round increases. But every time you place a good on the track you are committing it to that slot for the entirety of the game. This is important because some goods are easier to come by than others. There’s even a chart on the main board depicting the relative rarity of each good. The points awarded from the advancement track increase as the you move further to the right. So if you pile a mound of plentiful mushrooms in the first slot, they are only worth 1 point a piece. But manage to place them in a later slot and they can be worth up to 6 points a piece. Quite a difference. In order to accomplish such a feat means waiting until you can fill the earlier slots with the more rare goods. But waiting to fill the advancement means giving up on the constant and dependable income. It’s a difficult decision point that gives you something to chew on. On it’s own, it’s an interesting take on pushing your luck, but it feels at odds with the main emphasis of the game, the storytelling. Since the advancement track makes up a large component of your final scores, there’s a huge emphasis on getting different types of goods in order to maximize the advancement track. And yet exploration, the most fun action in the game, is incredibly random. The encounter that is read from the book is determined by the roll of a die and unless you’ve heard the encounter before, you have little to no idea what your choices will be rewarded with. It can be beyond frustrating to be rewarded with your sixth rope while watching other players get all the different types of goods they need. There is some buying and selling between players, but it’s a minor salve to a major problem. You could also forego exploring altogether by focusing on buildings for gathering resources, but then you’re missing out on the best part of the game. 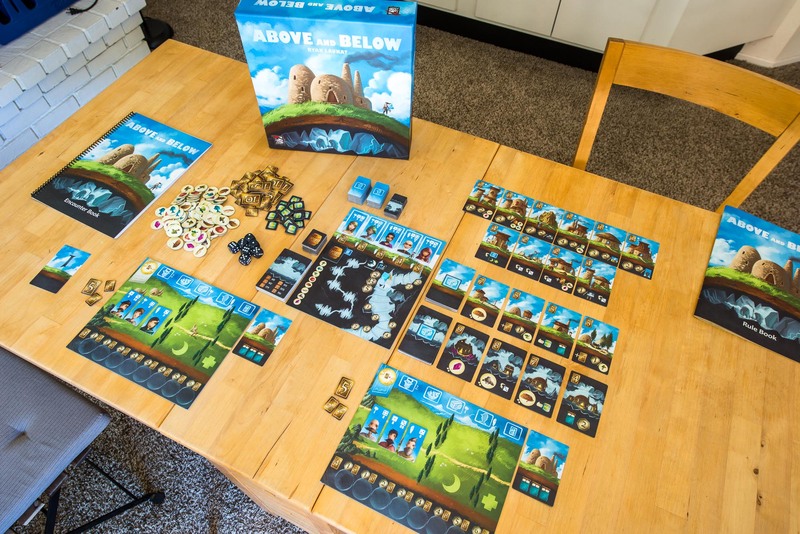 Above and Below tries to live in two worlds. There’s the storytelling world that is fun, but not quite as fleshed out as I wish it were. And there’s the traditional strategy game world that is betrayed by the randomness of the encounters. In an effort to appease both worlds, it doesn’t live up to the full potential of either. Players looking for a rich narrative driven experience will be disappointed that the storytelling doesn’t go deeper. And those looking for strong strategy will be disappointed by a run of the mill set collection game. Neither is strong enough to stand on their own and together they don’t do much to elevate the whole. That said, I did manage to have some fun once I let go of that notion that winning was within my control. Which is a bit odd when you think about it. I prefer my games to reward smart play and thoughtful action. Dice fests and luck driven experiences have their place, which is as far away from me as possible. But Above and Below has heart; it has moxy. It’s incredibly earnest and even with all of its faults, Above and Below manages to get by with a wonderful sense of place and provides some light entertainment if you’re willing to succumb to its charm.